If you're looking for the most interesting wearable tech and smart home projects looking for funding on Kickstarter, Indiegogo or other crowdfunding platforms, you've come to the right place. Every week we pick out the most promising ideas hoping to get public funding to make their idea a reality. It's not all one-way traffic, however, and it's a great chance for anyone to become an investor in the next big idea. Read on for our top crowdfunding picks and also take a look at our guide to being a crowdfunding success story. Despite cameras and smartwatches generally not mixing well, Beoncam could have found a way to bring peace to the issue. 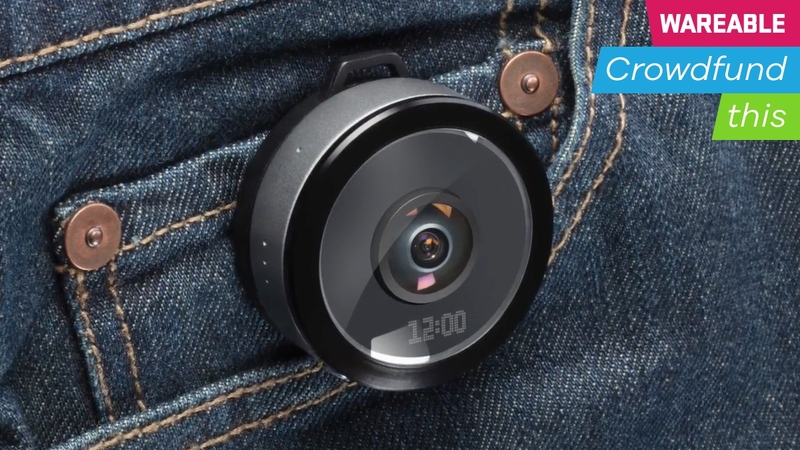 The wrist device features a removable, always-on 360-degree panoramic/190-degree hemispheric camera, with one click allowing you to snap up to three hours of continuous recoding. And while Beoncam's emphasis is offering you a seamless way to snap the scores of interesting things you get up to, it also doubles up as a timepiece and second screen for your notifications. When you decide to unhinge the camera from your wrist, you can make use of the companion app for Android and iOS to remotely control the device and share captured images or video. The Beoncam Indiegogo campaign has a funding goal of $30,000, with Early Bird specials starting from $99.00 (60% off the eventual retail price of around $245) and including accessories such as a wrist strap, tripod mount with a cradle, a bicycle handlebar ring and a helmet clip. Valentine's Day may have come and gone, but this connected bracelet wants to help you feel closer to your loved one when they're not close by. Hey wants to bring you closer together with friends, families and lovers by letting you send a 'real human touch'. It works with users both wearing a bracelet and connecting to the companion app over Bluetooth. When you touch the Hey in two places, it softly tightens the wrist band to mimic human touch, which the other user will be able to experience. It's designed for both men and women to wear with white & rose gold and anthracite & black versions on offer. The weather proof wearable charges in 30 minutes and will stay powered for up to three weeks. The HEY Kickstarter campaign is already in full swing and is approaching its target €125,000 goal with plenty of days left to raise the rest of the cash. €74 will get you two bracelets with shipping expected in August 2017. Meet the latest wearable that wants to help you de-stress and get a better night's sleep with a little help from your VR headset. The small device, which features a series of sponge electrodes, clips onto the strap of most smartphone-powered VR headsets including the Samsung Gear VR. It then uses FDA cleared technology that stimulates the brain to product serotonin, endorphins and melatonin while lowering cortisol (the stress hormone). It's being developed by Fisher Wallace Labs, a company that has already built a wearable neurostimulation device and says it has multiple published studies to prove that its tech is safe and effective in reducing stress and sleep management. Where VR comes into play is the idea that certain immersive experiences can enhance the effectiveness of the Kortex setup and that's why Fisher Wallace has partnered with ustwo games to bundle in a free copy of Land's End for Gear VR. The Kortex Indiegogo campaign is now live and is hoping to raise $75,000 for a project that is still at concept stage. $299 will get you an early bird discount and those willing to pledge $449 will also get the Samsung Gear VR bundled in as well. It's already made a sizeable dent in that $75k target with more than a month left to run on the campaign. Kortex has passed its $75,000 target goal $50,000 and with that early bird discount still up for grabs. This wearable, which attaches to your dog collar, isn't your bog-standard location tracker. Jagger and Lewis' smart dog collar wants to measure indicators of health and happiness instead and match these up to a database of dog breeds and behaviours with algorithms designed by vets. So we're talking how much your pooch is eating, drinking, scratching and sleeping, distance walked, even how much your dog is barking. The system is designed to detect anxiety, aggression, hyperactivity and hyper-attachment to owners. Then if something looks abnormal, you'll know it's time to take your pet to the vet and share the in-app behaviour report. Modes include away, guest (e.g. for dog sitters or kennels) and challenge mode. Jagger and Lewis is looking to raise $50,000 on Kickstarter and it's already halfway to its target with three weeks to go. It costs $149 - though there are some early bird options left - and is set to ship in May 2017. We told you hearables were going to be big in 2017 and UK-based startup Third Skin is getting in on the action with its pair of truly wireless smart headphones that want to offer a discreet listening experience. They're designed to be worn behind the ears with the earpieces sitting inside each ear. From there you can use a host of features including active noise cancellation for when you want to drown out the world, voice and gesture controls to quickly activate smartphone features like music playback, and there's even room for biometric sensors to track your health and fitness. Third Skin's Indiegogo campaign is live now. $189 will get you a pair with a shipping date set for April 2018. Third Skin has tipped over its $50,000 so Hy is happening. If living in a social networking bubble has left you unable to actually communicate how you feel through the spoken word, Emora is on hand to help. This wrist-worn wearable allows you to select from a variety of colours to represent your mood, with a flick of the wrist activating your mood shade. Emora claims its device also connects to your heartbeat to set off a series of pulsating lights and will enable you to connect with three other Emora wearers. One of the sneaky great features is the map pinning. A tap on the wrist can highlight where you have been, making sure those you connect with know just how you feel about being at work or a satisfying gym session. Emora still has a couple of months to run on its Indiegogo campaign — currently sitting shy of its $50,000 goal — but pledging $129 on a Super Early Bird offer can help you nab a bracelet for the expected shipping in November. Or you can double up for $249 to avoid sending random emotive colours into the ether. Emora's Indiegogo currently reads: "EMORA- Connect Feelings Beyond Words is currently being updated. Please check back later and show your support." Watch this space, we guess. While not winning any prizes for branding, the Anti-Snore Wearable is a handy armband that aims to quell your snoring and incessant teeth grinding. Unlike the smorgasbord of old wives' methods out there, this smartly detects sound via a dedicated app and provides you with a gentle vibration to turn over. As most people snore when sleeping on their back, this essentially works as an automated nudge and helps users avoid a night on the couch. The creators note how the app can also detect different kinds of noises, meaning you shouldn't be hit with never-ending prompts if next door happens to be throwing some kind of deep house soiree. The Anti-Sleep Wearable first popped on our radar when undergoing Kickstarter funding in November, but it's back at it again with an Indiegogo campaign that's surpassed its goal of $50,000 with two months still on the clock. If you missed out on the first go-around, a small portion of Super Early Bird offers are still available, which would see you pick up the Anti-Snore Wearable for $75 when shipments are expected to begin in March 2017. The Anti-Snore Wearable is happening. Arrow Electronics has passed its $50,000 target with a month left to run on the campaign. Kick off the New Year by becoming a patron of the VR art scene. This awesome project is bringing a mixed reality recreation of the first photography exhibition in 1839 to four real locations in the UK in 2017. Thresholds VR is a collab between artist Matt Collishaw and the Mixed Reality Lab at Nottingham University and the photographs in question, by Henry Fox Talbot, have now faded. But you'll be able to see virtual versions alongside technical innovations from the period as you walk around real objects with "ghostly auras" to make sure you don't bump into other visitors. By pledging £25 on Kickstarter you can book a slot for two people at one of the four confirmed venues all around the country: Somerset House, the National Media Museum, Birmingham Museum & Art Gallery and Lacock Abbey in Wiltshire. If you pledge £200 you can go to the VIP preview. Collishaw and co were only looking for £20,000 and they have managed to shimmy past that total with hours to spare. Testing has now begun at Nottingham University. An affordable, voice controlled speaker hub that comes with a 7-inch touchscreen and a 360-degree HD camera, WooHoo is also a subscription AI smart home service ($9 a month for 32GB cloud storage). Phew. So you can tell it what music you want to play, control smart home gadgets like Nest and order Ubers plus there's a temperature sensor and you can also use it as a smart security cam. Pledge quickly as there's still some $49 units left which includes a 12 month sub and it's already over its $30,000 target too. Sure, it doesn't look as industrial chic as an Echo but it's stacked with features and the non early bird Kickstarter price is still only $89 with a range of colours to choose from. It's set to ship in June 2017 so Smart Beings could beat the rumoured Amazon Echo 2 which is due to come with its own screen. The WooHoo has secured its funding passing its $30,000 target goal with days to spare. This affordable, wearable cam bills itself as a VR shooter but there's actually quite a lot going on. You can pledge from $169 for one on Kickstarter. In return, you get a clip-on, rain, dust and heatproof camera that shoots up to 4K and 240-degrees. Not 360-degrees, no, but the reasoning is that 240 covers what the human eye can see. There's also a couple of videos showing off its horizontal video stabilisation feature which MySight promises will give you "amazingly stable" video without all the "dizziness". A lifelog feature can be set to auto record 10 seconds of footage every three minutes and the app can even stitch and edit highlights videos for you. It's already raised $47,000 of its $60,000 target and shipping is set for April 2017. The MySight 360 has crossed the finish line with $97,000 of funding and 8 days to go. Meet the remote that wants to make controlling your smart home kit a whole lot easier. The $199 HD touchscreen-toting device simply let's you point at your connected thermostat, Philips Hue lighting system or even smart lock and it'll bring up an interface that let's you take control. That's made possible through a combination of three motion tracking sensors that are placed around you room and an indoor positioning system that is able to automatically 3D map the room. It can then take control of over 25,000 devices over Wi-Fi, Bluetooth or Infrared with support for the likes of Nest, Sonos, Netatmo, Samsung and Belkin WeMo. It also works with services like Uber so you can order a ride from the remote. The Sevenhugs campaign has raised over $1.1 million, way over its $50,000 target. Nice one. On Kickstarter this week is the Lief smart patch. It's already raised $84,000 - more than its $50,000 target - but there's still some Early Bird units left. The stick-on is designed to train you with heart rate variability (HRV) biofeedback to increase your natural rhythm with breathing exercises. According to the creators, three minutes of syncing your breath to your heart rate can improve your stress response and, in time, your overall health. Lief is quite large but it is only 6mm thick and it's designed to be worn under your clothes, shaped to fit your torso. Exercises include control, resilience, nudge and calm - beta users in SF are already testing them. You can pick up a Lief patch for $249 early bird or $269 Kickstarter price - quite a bit cheaper than the $399 final retail price. Shipping is set for June 2017. Lief has raised $405,000 to help bring its smart patch to life. Yes, there's even wearables for horses or horseables as we've decided to nickname them. French startup Equisense is following up its Motion wearable for equestrian sports (pictured above) with the Equisense Care, a connected body suit that features sensor technology that is able to help riders monitor their horse's health 24/7. When paired with the companion smartphone app, you'll be able to track data such as heart rate, respiratory rate, perspiration, temperature, movement and even sleep. It's also able to evaluate a horse's anxiety and stress level in real time and can send alerts to help provide early treatment of colic, the leading cause of death in horses. The setup works with or without a subscription, but you'll need to pay €9,90 a month to benefit from the real time data and alert system, which works over a 3G connection. It's already raised more than its €50,000 goal on Kickstarter with plenty of days still left to run on the campaign. A pledge of more than €149 will get you one Equisense Care connected body kit with 3 months subscription for free. It's expected to ship in September 2017. Kids wearables are becoming a bit of trend at the moment and the amazingly named Pomo Waffle smartwatch is promising to do more than keep an eye on your little ones when they go out to play. It also wants to help users express creativity by letting them personalise the Waffle by adding different cartoon watch faces and switching up the Waffle bands. There's also features to give kids more responsibility. Parents can build schedules in which reminders can be set to say when it's time for bed or having some fun. A smart wallet means they can even make purchases using QR codes and NFC chips. It's not ignoring tracking features entirely of course offering step-by-step directions to get back home and an SOS mode that kids can activate to send location data to parents. You can then speak through the watch so you know what's up. Parents can also create a safe zone that will sound an alarm if they go beyond that designated area. The colourful wrist worn device runs on Android 5.1, packs in an LCD touchscreen and is water and dust proof to withstand a little rough and tumble. Other features include exercise tracking, an alarm clock mode and there'll also be a Pomo store letting app developers add further features including handwriting practice. Pomo House is hoping to raise $30,000 through its Kickstarter campaign. If you want to get one, you'll need to pledge more than $99 with shipping expected for May 2017. Pomo House has raised over $60,000. 'Fitbits for pets' are becoming part of our lexicon', and a new crowdfunding campaign doggy wearable Felcana offers more ways to keep tabs on four-legged friends. Unlike many of its peers – including PitPatPet and Whistle – Felcana works for dogs and cats. It monitors daily activity, eating habits, sleep and ambient temperatures. The device comes with a collar, clip and home hub for charging, plus micro beacons which you place around your home, which monitors your pet's habits. Felcana will then track feeding bowl habits, visits to its water, general activity such as running and jumping, look for changes in habits. Felcana claims to alert owners to signs of polydipsia (increased drinking), which can be linked to diabetes and illnesses in pets. A full range of data appears in its partner app, which is available for smartphones and via the web. With no fees or costs, Felcana looks to boast a pretty good set of features – aside from GPS tracking, which is always a key inclusion for pet owners, but tends to increase size and cost exponentially. In terms of pet wellness, Felcana looks the business. A $79 early bird offer gets you a Felcana tracker and a clip (as well as two beacons) though you have to pay extra for a proper leash and collar. The company is only looking for £25,000 and has raised £21,000 so far. £26,191 raised, just over the target and "a massive thank you" update. We've covered a few posture trainers on Wareable, and you can read our roundup of some of the best here. Poze, which is currently running a campaign on Indiegogo, also wants to help you get out of bad habits. The small device attaches to your clothes or even directly to your skin, and emits a buzz if it detects you slouching for a minute, encouraging you to correct your posture and sit up straight. What we particularly like is the fact Poze doesn't use an app - somewhat of a rarity in today's wearable devices - and that it doesn't need charging, with a battery lasting for "up to a year". At 35mm wide and tall, it's pretty discreet too, and weighs just 12g. Poze is already at 519% of its $8,000 goal with 9 days to go, so it's certainly been a successful campaign. It will start shipping in December, and early bird backers will get a discounted price of $39. Otherwise it's going to be available for a retail price of $68. Poze raised a total of $134,360 and backers can look out for updates on shipping and updates. Emotion sensing wearables are hot right now but Sence started off as a software platform, which the startup Planextra initially hoped to license to big players like Fitbit and Apple. People want to measure stress, anxiety, happiness, but most wearables can't give us this information yet. So instead the team built its own hardware with wrist-based ECG, which it says is medical grade thanks to proprietary algorithms that get remove noise (e.g. electrical signals from muscle contractions). Like the similar Zenta from Vinaya, the Sence Hub app analyses heart rate variability and maps this onto 64 emotions/bodily states - two levels of intensity for each - to help you track how you're feeling. The design itself is unusual, but not ugly, with microUSB charging, IP64 waterproofing, LED alerts and standard activity tracking. Shipping is planned for August 2017 with an ultra early bird price of $129 and a Kickstarter price of $169, which is 35% off planned retail cost. Planextra is looking to raise $100,000 on Kickstarter and it's nearing half of that with 21 days left to go. Sence got $130,000 in total from 800 backers and pre-orders are still open. It's a well known fact that alarm clocks are humanity's mortal enemy. But Bonjour is an alarm clock that also wants to be your personal assistant. It sounds a bit like the Amazon Echo, similarly able to adjust your Nest devices or control your music, but Bonjour will also learn your habits and preferences over time. This will affect what it tells you and when it wakes you up. For example, if you like to surf (to take Holi's example), Bonjour will know to wake you up if it detects it's perfect weather for jumping on a board. Holi says Bonjour will also anticipate your needs, such as checking your smart devices to make sure the house is secure at night. The $50,000 goal has already been smashed on Kickstarter with $250k raised so far - Holi is targeting a $249 retail price, shipping June 2017. Bonjour has been a huge success raising more than $730,000 from 5,500 backers. The latest VR headsets may be hitting the stores, but MVR – a new London-based start-up – wants to give your existing games the virtual reality treatment. The patented headset uses a smartphone as a display, which takes advantage of the Sony Remote Play and Xbox's Windows 10 streaming features to show the action from your console. You use the special MVR controller, which offers up control of the right stick to the headset, which has a positional sensor on the strap. You can then enjoy 360 degree head-tracking in your existing VR games. It's an interesting concept and one we were treated to at a showing in London. The head-tracking worked extremely well, especially given the lag not only from the sensor, but from the streaming. However, the experience wasn't particularly comfortable, and there's plenty of work to be done with the screen and design. Unfortunately this is one VR headset we are going to have to live without as MVR only managed to raise £15,000 towards it target goal of £150,000. Who's that at the door now? The great thing about smart doorbells is that you can still catch that delivery even when you're not at home. They're not a new phenomenon, but Ding is aiming to keep things as simple and stylish as possible. The three-part setup includes a weather resistant doorbell button that sits near your front door, a mountable chime speaker that sits inside your home and is paired to your home Wi-Fi network, plus the companion smartphone app. When someone presses the bell, you'll be able to speak to them without going to the door. You can also set up Quiet Time periods during the day when you don't want to be notified of any visitors. There's an indoor range of 40m and the button can be hard wired or battery powered with the latter option giving you six months of battery life. As far as security is concerned, if someone nabs the button, they won't be able to get access to your home network. There's no camera or any sign of IFTTT support, so this really is a basic albeit sleek looking solution to smartening up your front door. $111,000 raised in its Kickstarter campaign, nicely done. If you read our roundup of the best connected tech on show at the NYC Maker Faire, you'd know that we've already tried out, and been impressed by, Gravity Sketch. Originally a 3D-sketching tool on iPads, the next-gen art app is now seeking funding on Kickstarter as a VR-native app for the HTC Vive (as well as a desktop version). Gravity Sketch has a unique feature that allows you to 3D print your creations — something rival Tilt Brush can't do as of yet — which its creators hope will appeal to professional customers like game designers or animators. On Kickstarter the creators announced they are closing the campaign due to attracting "big players and great opportunities", which means they no longer need to rely on pre-orders. But fear not, Gravity Sketch will still launch - they just don't need your help to make it happen. The team said all Kickstarter backers will get "exclusive Beta testing", for which they'll be offering sign-ups for soon. Crowdfunded projects love slipping in a 'world's first' claim somewhere. For the SOWATCH it's the "world's first autonomous smartwatch that tracks cardiovascular health, blood pressure, customises your workouts and prevents diseases". Though we've seen some of these features in other wearables, this watch is certainly tackling health and fitness with no half measures. The watch claims to do a wide range of things including tracking blood pressure, detecting heart variability, monitoring blood oxygen, detecting fevers, monitoring your training - and all running on up to 10 days of use without a paired smartphone. And did we mention the built-in GPS? Big claims indeed. If it manages to pull of this off for its targeted March 2017 launch and for a reasonable price, we'll be hugely impressed. The company says the retail price will be more than $260 but won't say exactly how much. It's not the best looking watch, that's for sure, but if it comes packing all of these sensors and features then we can overlook fashion - this thing would be like having a GP on your wrist. And people are voting with their wallets, with the watch raising more than $362,000 on Kickstarter, smashing well past its $100k goal. Sleep devices are ten-a-penny but Thim - which is worn on your finger - wants to re-train how you sleep not just measure it. It's based on the work of Flinders University Professor Leon Lack - who previously collaborated on the Re-Timer light therapy glasses - and aims to condition you into falling asleep more easily by waking you up with soft vibrations. Seriously. The team recommends using it for one hour over the course of seven days to make a difference. There's also a power nap feature which wakes you up at precisely ten minutes after you've actually fallen asleep and the startup claims its sleep tracking is super accurate as it measures if your finger moves when it feels the vibrations through the night i.e you're awake. The sleep wearable comes in three different sizes and the Kickstarter price is $129 AUD but there are still early bird devices left for $119 AUD if you're quick. Shipping is scheduled for May 2017 which sounds like a more realistic timeline than come campaigns that have come and gone. Thim is looking for $120,000 AUD. Thim raised $126,607 AUD from 725 backers. The team will be posting updates between now and May 2017. We've started seeing more tech companies looking at hydration, but LVL claims to be the first wearable hydration monitor. It's difficult to verify that claim in a world overflowing with crowdfunded products, but it's certainly the first dedicated one we've seen. The LVL looks like your regular fitness tracker and also monitors your activity, sleep and heart rate - but it all comes back to hydration. The LVL keeps track on how much you're drinking throughout the day, and then gives you alerts, like letting you know if you're running low, or telling you how much you need to drink to get the most out of a gym session. It will also let you know how much to drink before bed to help you get a better night's sleep. However, we assume you'll need to enter your water intake in the accompanying smartphone app for the device to be able to crunch the numbers. The design of the tracker itself is nice, and there's no denying the importance of staying hydrated, so we're intrigued to try this for ourselves when we can wrap one round our wrist. The LVL soared past its $50,000 Kickstarter goal to eventually raise a very impressive $1,186, 983 from 7,501 backers. That's one of the biggest wearable tech Kickstarters we've seen this year. Pledge for a set of three Dots (for $55) to stick at home, in your car or at work and get contextual alerts based on your precise location. Dot is on Kickstarter now and could be a simple but smart addition to a home that's already seen some Nest, Sonos, Hue and LIFX love. Billed as a Bluetooth 4.0 "digital post-it note", Dot also talks to your phone and can, for instance, turn on a LIFX smart bulb when you enter a room or tweak Nest settings for how you like the temperature. Or when you get into the car then Google Maps launches, when you're in the bathroom it can light up to remind you to take medication. Kind of like your own personal iBeacons set up, without the advertising that comes with it. Get five for $85, ten for $170 and shipping is set for March 2017 so not too long to wait. A resounding one. The Dot hit $115,401 of funding, well over its $20k goal and from 1,714 backers. File this one under 'Totally unnecessary but totally rad'. The Lift anti-gravity levitating smartwatch charger and lamp (to give it its full official title on Kickstarter) lays claim to the title of "the only smartwatch charger that levitates in mid air while it charges". That's correct: your watch will slowly rotate as if by magic, with levitation achieved by magnets, but the fact it charges while suspended in mid-air, we'll admit, is pretty cool. The Lift, created by the company Levitation Works, uses a proprietary induction system inspired by Tesla's own induction tech. The stand will work with the Apple Watch and the Pebble, and will let you feel like you're living on the Starship Enterprise. But wait, what's that? The stand doubles up as a lamp when it's not charging your watch? What a time to be alive. The charging unit can be replaced with a device called the Orb, a wireless lightbulb that will similarly float in the air while emitting a glow, looking like it belongs in Hogwarts. The company says these Orbs will magnetically stick to any metal surface, so you can buy multiple Orbs without needing a dock for each (they've got batteries inside). The base and a choice of either the charger or Orb will come to a retail price of $249, says the company, while you can opt for a Pro version of the dock that will also charge your phone - and costs $299. Mass production is scheduled for October, so it won't be long before you can tell your loved ones, "Friends, I am truly living the dream". The campaign raised over $283,000 on Kickstarter but was then cancelled out of the blue. Essentially it's the fault of the Series 2's bigger battery but Levitation Works plans to be back on KS soon: "Shipping it optimized just for the old Apple Watch just doesn't feel right." Smart locks haven't really captured our imaginations quite yet, although we do have a growing fondness for start-up August. But a new crowdfunding campaign out of the Netherlands could add some competition into the market. Bold is a smart lock that enables keyless entry to your home via your smartphone. Bold's bold idea is a system with no manual key back up, that can be fitted to European style locks. The company says that UK and US style locks are coming, and asking for email requests to gauge interest. The makers say that it's safer that competition thanks to a motorless design, which reduces risk of mechanical failure, and has fewer weaknesses thanks to the omission of a manual key. That's slightly misleading as there is a tiny motor to change the clutch, but users physically turn the lock to open the door, which means less parts which rely on automated mechanics. So what if your smartphone dies? Well there's a manual remote for €39 extra or you can grant friends or neighbours access – just like a digital key. There are a couple of downsides. Smart locks are a big exercise in trust, so Bold's makers will have their work cut out to convince people they're guys to protect the threshold Also the app looks terrible. Like worryingly bad. That makes us cautious. Anyway, Bold is working towards to its €120,000 target, but with only 4 days to go at the time of writing and €65,000 still to raise, it needs to get its skates on. The lock will cost €199 but early birds can grab one for €149. The target wasn't reached in the end but Bold will be back - the campaign page says it will relaunch on this site soon. Getting on Apple's good list is no mean feat. But that's exactly what ThanoTech has done, albeit with preliminary MFi approval (Apple's licensing arm). It has, according to its Kickstarter page at least, created the first world's first portable MFi watch charger with the Diskus. Essentially, Diskus is just like your current Apple Watch charger but, instead of the wire being permanently fixed to the dock, you just plug a regular old Micro USB plug into a portable dock. There's a cable that comes in the box, obviously, but you're free to use one of the 157 that you've no doubt got sitting around your house. It's a touch thicker than the regular Apple Watch charger but that's the trade-off for getting that Micro USB port in there. You do get a swanky little pouch with it and it only weighs 16g, so it's hardly going to put a strain on your bag or purse. It costs $30 and shipping is estimated for October. By then Apple will no doubt have a new watch out… let's hope it's the same charging method or you could be backing a dud. ThanoTech is looking for $55,000 and is well on its way with plenty of time left. Over 100% funded with plenty of time left. Boom. With the Samsung Gear 360, the LG 360 Cam and Ricoh Theta S already making the ability to shoot 360-degree videos and photo more affordable, the Nico360 cam is the latest to join the immersive party. The Nico360 Indiegogo campaign is up and running and in the search for $50,000 has already surpassed that total with a month to go. The $129 early bird offer gets you the camera plus a self-stick kit with shipping expected in October 2016. 329% funded with a month left. Boom. As with devices like Thync, we're intrigued and cautious in equal measure by ELF emmit, the latest mood altering headband to hit a crowdfunding site. In development since 2013 and tested at a university in Slovenia, it is designed to de-stress or stimulate you, help you meditate or sleep by emitting pulses at varying frequencies, from 0.2Hz up to 19 Hz. So, yes, it's a wearable PEMS machine. From the campaign it looks like the team is suggesting sessions between 30 to 120 minutes. It's open source tech and the headband itself is made from polycarbonate and thermoplastic plus it's powered from your phone's headphone jack. You can still get the $99 early bird units on Indiegogo which is 50% off the RRP. The team has crept over the goal with time to spare. There are plenty of sleep monitoring platforms out there but none that claim to fast track the time taken to hit deep sleep. Well, until now that is. That's the USP of FitSleep, which features the brilliantly named 'E-Lullaby' technology to provide "alpha waves to gently send you to sleep". It does all the other sleep monitoring stuff you'd expect such as logging your heart rate, respirate rate, body movements, sleep patterns and so on; but we know you're itching to hear more about the E-Lullaby science. Well, according to its developers, FitSleep emits 0-13Hz waves during a user's light sleep cycle that speeds up the transformation to deep sleep, thus increasing sleep efficiency. They describe the process at being "lulled by modulated alpha waves". Incredible stuff, we're sure you'll agree. Of course, we'll only know if the hocus-pocus on offer here genuinely works if the product sees the real world. And it should as the $100,000 goal has been met with over a week to go. $129 gets you one and shipping is set for September. This smart connected cycling helmet follows in the footsteps of Lumos and Livall making that tricky commute ride to and from work a much safer one. Packed with cameras front and back to scan your environment, the Classon is able to detect cars approaching your blind spot and notify the rider by a blinking light on the visor. There's also motion activated lights when you signal with your arms and the built-in accelerometer activates brake lights when it detects you're slowing down. A Classon subscription service gives you access to additional features like GPS navigation and the ability to access video recorded by the cameras to edit and share. You'll also get free helmet replacement if your one gets damaged and access to new features when they land. The Kickstarter campaign get the Classon smart cycling helmet in production is now live and is aiming to raise $30,000. It's already made a sizeable dent in that figure with plenty of days to go. You'll need to pledge $99 or more to get one along with 6 months free Classon Club subscription. That's significantly cheaper than the $299 retail and $499 beta price. Goal hit and the company are now setting (pretty ambitious) stretch goals. Smartwatches are often criticised that they're not as good at telling the time as regular ones. Joy is shaking this up with its icon based watch for kids - it links the time to events and sends visual reminders (bath time, feed the cat etc) from parents. For kids from three to eight years old, Octopus has three modes to switch between as your children grow and get to grips with the concept of time. You can still get an Octopus watch for the early bird price of $59 even though the team has already doubled its target. It comes in a range of fun colours, of course, and there's the option to gamify chores and whatnot with virtual rewards. Even better, there's a cute additional charger (the companion) which also works as a nightlight. It will ship in March 2017. Octopus has raised $663,000 on a $50,000 target with over a week ago. SenseON is a small band-aid style wearable made from silicone and medical grade tape that sticks onto the skin and promises to measure heart rate as accurately as a heart rate monitor chest strap. That's thanks to conductive electrodes built into the sweat and water resistant design that can capture the heart's electrical pulses, which is the same process used in medical EKG monitoring. That means it can deliver real time data on heart rate, heart rate zones, resting heart rate while sleeping and heart rate recovery. Additionally, it's packed with sensors to monitor breathing rate, track steps, distance covered, calories burned and sleep. Data is synced to Android and iOS phones with support for Bluetooth sports watches letting you review data from the wrist. Battery life is an impressive 20 hours in continuous use with a portable charging case delivering 8 full charges. The SenseON Indiegogo campaign sees the Shenzhen based company CardioCycle chasing $20,000 and is already halfway towards that goal. A minimum pledge of $79 will secure you one with an expected September 2016 shipping date. This isn't the first smart band-aid we've come across. AmpStrip, which raised big bucks through crowdfunding, cancelled plans for a consumer product. FitPal, another device that sticks directly onto the skin, was expected to ship in March 2016, but is still listed for pre-order on the company's website. Target hit with a month left to go on the campaign. A story we've been following on Wareable for a while now, the Mover Kit from Technology Will Save Us teaches kids to code through a wearable device. Essentially a build-your-own wearable, the kit includes the Mover board with lights, motion sensor, accelerometer, compass, magnetometer and a USB connector. Using these components, kids can code the device's behaviour to make it function in any way their imagination allows. It's a great and fun way to get kids creating and making with technology, using a wearable as the vehicle to get their imagination racing. After all, tech might just save us. The campaign has already blitzed its $50,000 target and $55 bags you the kit. The DIY wearable for kids has doubled its total and is expected to start shipping in the coming months. We've already written about this ambitious hearable and definitely have some burning questions to ask the creators, but if it's the real deal, then Pilot could really be a revolutionary wearable device. The real time translation smart earpiece sits inside of your ear (obviously) and features a microphone to capture audio from the person you're speaking to. It also uses speech recognition and machine translation to translate a host of different languages. These include German, Russian, Arabic, Mandarin Chinese and Hindi. Additional languages will be available at a later date. Available in three colours, Pilot will also be offering a secondary earpiece to stream music or to share with the person you're speaking with. The companion app will let you switch between languages and save them for offline use when you're traveling overseas. There's even a conference mode so you can have multiple people speaking different languages on the same call. Pilot is set to take flight in May 2017, with additional languages scheduled to be added later in the year. It's already raised over $1 million on Indiegogo, crushing its $75,000 target with a month left to run on the campaign. $199 will get you a set of two earpieces while a pledge of more than $359, will get you Pilots for the entire family. It's no surprise to hear that Pilot has continued to raise big bucks and has now passed the $2 million mark. In the quest for seamless home automation we've seen a wide array of gadgets and control methods thrown into the mix. However, if it works as well as its makers claim, Knocki might just knock the competition out. It's a smart home sensor that turns any hard surface - think walls and tables - into control platforms for your connected kit. By tapping you can set up Knocki to perform an array of automated tasks, such as switching smart lights on, turning up your music or unlocking your Wi-Fi enabled door lock. For simple tasks, such as the light and music examples, you can set up a one or two tap method, wheras security sensitive actions can be kicked off with a more complex tapping pattern. One Knocki unit can store ten actions and it's compatible with the leading smart home systems such as Nest, Samsung SmartThings and WeMo. Knocki smashed its target inside 24 hours and the super early bird deals are gone. However, $69 for one, or $189 for three is still pretty attractive. Knocki has managed to raise over $500k, which is well over its $35,000 target. There's still plenty of days left to run on the Kickstarter campaign, although you'll need to spend at least $79 to grab one when they ship in December 2016. Think of Nuheara's IQbuds as a pair of wireless earbuds that focus on altering your experience of hearing the world. Like Doppler Labs' Here Active Listening earbuds but without the music focus, you can now get a pair for $209 as all the early bird units have sold out. You can activate and control the buds' active noise cancelling via a companion app and create presets for different places e.g. office, plane, bus. You can also mix your own balance between your music and the real world and even enhance your hearing thanks to multiple mics on the IQbuds. Tap to answer calls, play/pause music etc and house them in the charging case which increases the battery life from four hours to 16 hours (= 3 recharges). Nuheara raised just shy of $750k - that's more than ten times its target. Shipping is set for December 2016. Last time out we picked a brain sensor reading headband as our crowdfund pick of the week and, to be honest, it made our brain hurt just thinking about how it could possibly work. Probably not what its makers intended. This week, we've decided to keep things a bit more straight forward with one of the simplest, yet most exciting, projects to date. AirJamz is exactly what it says on the tin... it's a Bluetooth packing wristband that allows you to play air guitar with sounds. You simply pick a tune (hundreds to choose from, we're told) from the paired smartphone app and strum away. Head-banging and bowing at the end of a performance is optional (but encouraged). The $30,000 target has been met. The team also announced a surprise gift in the form of the AirJamz Pick to swap the module into - nice. We've covered Melomind a few times in the past - the concept was first shown off way back in January 2015 at CES. Back then, the connected headset wanted to get rid of stress by using hi-tech biofeedback - reading your brain activity and transmitting it to a smartphone app where it's translated into music. It's now back, in more normal looking headphone form and its makers claim that it generates an audio soundscape that responds to your brainwaves in real-time. It will even tap into your own music collection. "When you train with Melomind to manage your stress and emotions, we made sure that you are plunged into a complete world of relaxation," reads the release. "Our goal concerning your experience was to have you carried away from the very beginning to the end; from the sound environment and the guide's voice while you choose a session, to the musical journey you embark on." Cynicism aside and the campaign has actually started with a bang. The company is already well over its €50,000 target and has some stretch goals lined up. You'll have to fork out €220 if you want one - the RRP is set to be €399. More than three times the target raised and, to celebrate, all models will come boxed with a protective case. Here, Bragi Dash, Samsung Earcle, the Microsoft Clip, everyone seems to be working on a hearable. United Sciences, a 3D scanning company is now joining the party too with the custom fit Aware. Packed to the rafters with biometric sensors, the Bluetooth in-ears promise to monitor heart rate, steps, distance traveled and calories burned. It even claims to track brain waves using EEG (electroencephalogram) to monitor stress, sleep pattens and relaxation. It's also going big on sleep tracking, learning when restless sleep happens. And The Aware can detect teeth grinding, which is linked to interrupted sleep. You can even monitor snoring. The sensor packed hearable also finds room for a noise cancelling bone conduction microphone array, a speaker and 16GB of storage for storing music so you can work out sans smartphone. United Sciences is chasing $100,000 on Kickstarter and is already halfway to that goal with more than a month to run on the campaign. If you want a pair, you'll need to pledge more than $249. There's also pair of Aware headphones that come without the biometric and brain monitoring powers available for $99. If you can spare $10,000, you can bag yourself a tour of the United Sciences lab. Metallic finishes announced as a stretch goal. The best crowdfunding ideas are the ones that seem so obvious, it's a wonder no-one's thought of it before. Such is the case with the SpeedX Leopard smart road bike.